Oh my, I'm SO glad today is Friday. This weekend I'm planning a big shopping trip mainly because I lost 14 lbs! Yay! This clean eating lifestyle has helped not only me, but also my hubby lose extra weight. Here is a clean eating printable I use on my fridge/cupboard to remind me what to eat. Losing weight is hard, but so fun. Now I'm rewarding myself with some well needed fall clothing! While we are on the subject of fashion I should tell you about today's AWESOME giveaway. Woo-hoo! 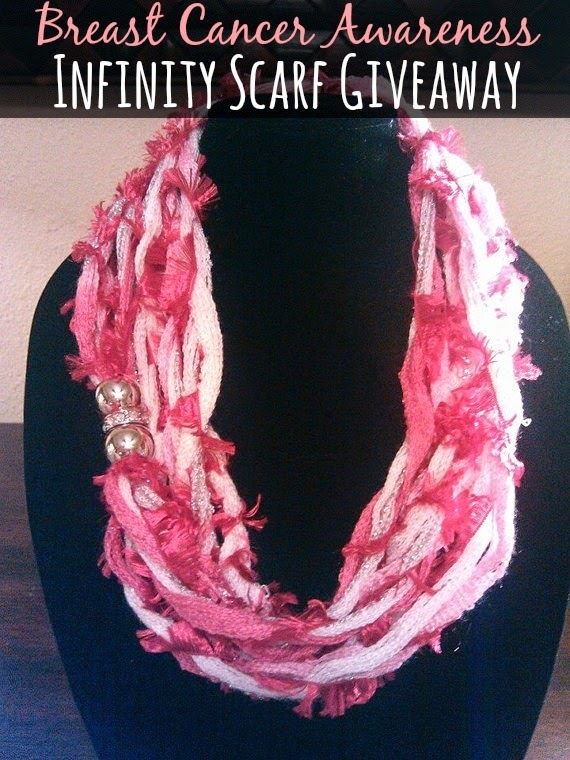 Sherri's Unique Designs will be giving away one Pink Infinity Scarf in support of breast cancer awareness. Sherri has an adorable shop that mainly has beautiful scarves. My favorite is the giveaway scarf! Too cute! Make sure to check out her store. Best wishes to all those who enter this fun giveaway and stay tuned for even more giveaways! Don't forget to read the Terms & Conditions below. I was not paid/compensated to write this post. Everything above is based from my opinions. I like Black Beaded Scarf Necklace. Brown scarf would be great for fall. I like the red and black scarf necklace. These are so nice looking. I like the Rainbow Color Scarf Necklace. I like the mens extra strong magnet bracelet. I like the blue and purple scarf necklace. CONNIE SOWARDS commenting: I like the Rainbow scarf necklace. I like the green and yellow scarf necklace. Love the leopard scarf necklace! I LOVE THE White Jade and Pink Magnetic Therapy Bracelet with White Jade.